Palalawan Riau Regency is a suitable destination to satisfy surfing desires. Many foreign surfers come all the way to Riau just to conquer the river waves which are located right on the equator. Bono is the term wave on Kampar Riau River. 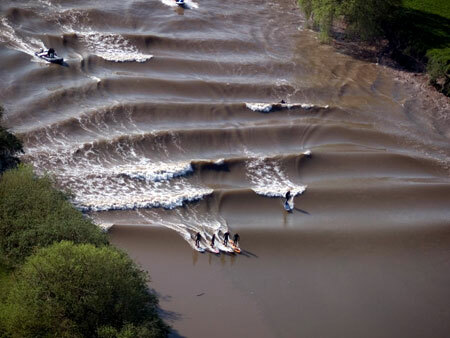 If waves are usually created in the oceans and beaches, in Riau waves are created in the river. This Bono wave is actually one of the natural phenomena because of the meeting of river currents towards the sea and ocean currents that enter the river due to tides. the uniqueness of tourist attractions in Kampar Riau is a unique and very different attraction. Besides Kampar River, Riau there are also many destinations that can be found. Ranging from nature tourism to playgrounds that are here. Here are some tourist attractions that are being hit and visited by many tourists. This tourist spot in Kampar Riau is perfect for tourists who like challenges, especially surfing. In this river there is a unique natural phenomenon, where the river will be choppy and often used by visitors to surf. The wave phenomenon (Bono) only occurs at certain times. Namely when the full moon occurs every 10-20 in the range from August to December. At the time of the small month Bono was almost non-existent. So who wants to feel the sensation of playing surfing on the Kampar River, make sure that tourists come here during the full moon. Riau has another unique tourist place, the Gulamo River. 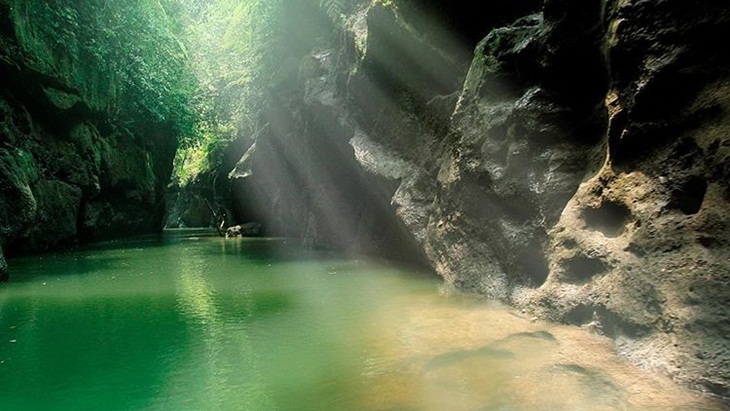 This tourist spot in Riau is also mentioned with Green Canyon. Because the Riau gulamo river is very similar to Green Canyon in West Java. On the gulamo river, tourists will witness the beauty of the river that divides the canyon and the steep cliffs resembling Cukang Teneuh or the land bridge. When heading to tourist attractions in Riau the tourists will be spoiled with a very beautiful natural beauty. Coupled with the panoramic view of the hydropower lake when the trip to Sungai Gulamo is guaranteed to be more fun and not boring. Riau is also called the city of a thousand waterfalls because it has many waterfalls, one of which is the Batang Kapas waterfall in Riau. This waterfall is the highest waterfall in central Sumatra with a height of about 150 meters. 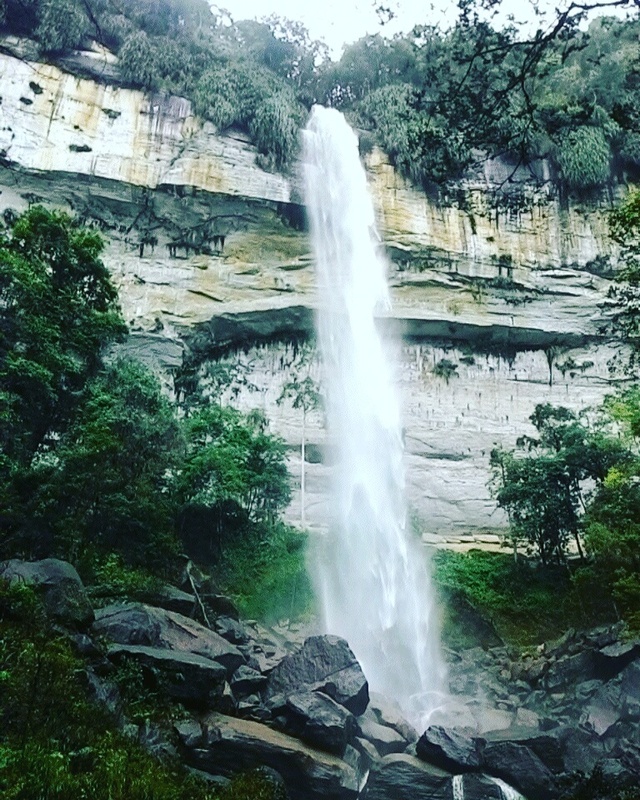 The location of this waterfall is in Lubuk Bigau Village. When viewed from a distance this water does look quite magnificent with white rocks around it. For tourists who like camping, can also be camping in the area around the Batang Kapas waterfall. There are special spots that can usually be used by tourists to set up tents. Enjoy the tranquility in the midst of unspoiled nature, accompanied by the sound of the thunderous water and might be a memorable experience in Riau. 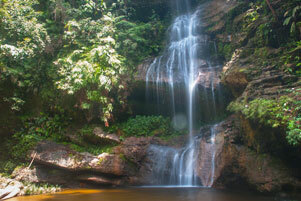 Panisan Waterfall is one of the tourist attractions that has natural beauty like a private place. Because Panisan waterfall is still quiet from visitors and the water is still very clean and clear. The uniqueness of Panisan waterfall with three levels. At the first level the height is 25 meters and then at the second level has a height of 30 meters and at the third level has a height of 7 meters. To get to the tourist attractions in Riau, tourists must cross the Kampar River by boat. After that tourists must walk approximately 8 kilometers by passing rubber gardens belonging to local communities, forests, and hills. And there are still many tourist attractions in Riau that might be very entertaining for tourists who have never been visited. This Article has Earned 1558 Tokens. I used to like surfing. Unfortunately, myopia is too heavy now. The doctor said that me is not suitable for that sport. Bereh that tempat, hawa teuh tajak..
Dear friend you are awesome and beautifully covered this place in your article, it’s nice to read the stuff and see the natural phenomena heart touching really. Stunning, thanks for sharing my friend. Wow..the nature is very beautiful. I really liked the pictures. If you have shared the footage, it would have been better.